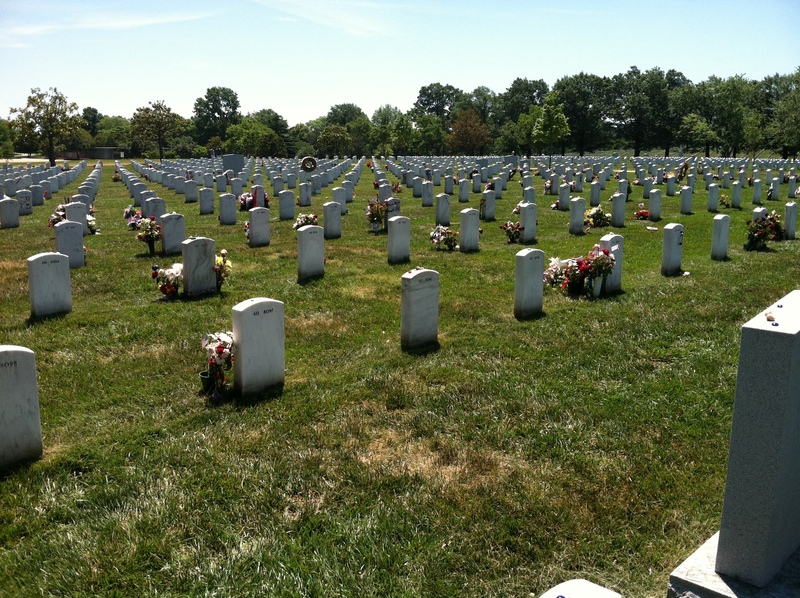 Recently I returned to Arlington for the first time since the burial of a dear friend in 2004. There are 624 acres in Arlington National Cemetery where more than 14,000 veterans have been laid to rest, dating all the way back to the Civil War. The rolling hills, dotted with white marble, are surely a site to behold. Among presidents, historical heroes, countless memorials, and the famous Tomb of the Unknowns, lies a section that is noticeably different. Given my short trip, I had no time to visit the others, even the Unknowns, I had far too many “knowns” to visit. Walking through the majestic gates and past endless rows of graves, I came to to a place that is all too familiar, the section where the gravestones are a bit whiter and the ground is noticeably more trampled. It’s the section where one begins to see many vases of flowers, tiny stones, coins, and tokens crowding nearly every grave in every row, particularly after Memorial Day. There are letters from spouses, children, mothers, fathers, friends, and perhaps even pictures or stickers stuck on the graves. There are visitors, not just tourists, but friends and families who are clearly connected to the warriors buried within the sacred grounds of Section 60, the place many veterans of Iraq and Afghanistan are now rest. Nine years ago my husband and I stood on a lush knoll on the eastern edge of Section 60, alongside a young widow and her two boys, ages 3 and 5 at the time. 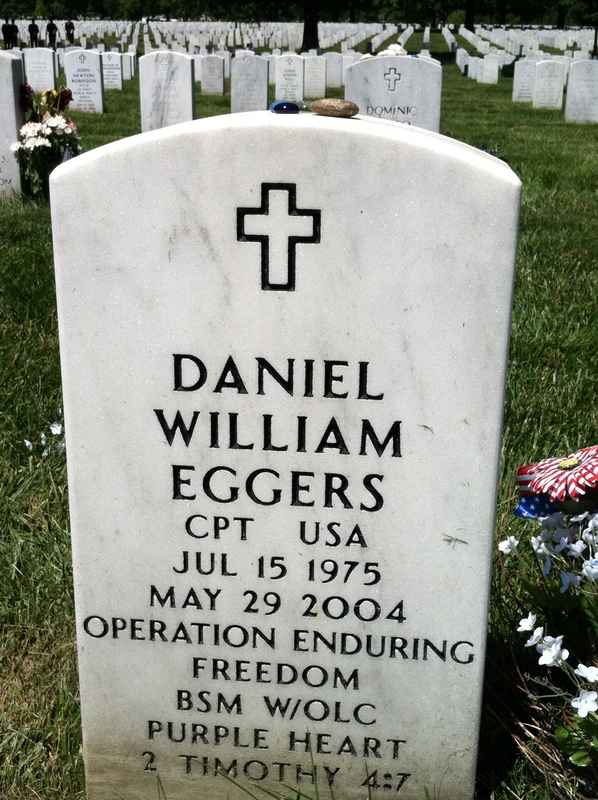 As we stood over Dan’s casket in 2004, I remember thinking, “Surely this war will be over soon.” To my dismay, exactly 8 years and 364 days from Dan Egger’s death, I found myself standing, yet again, in Arlington National Cemetery next to yet another widow and two more small boys, ages 17 months and 3 years old. On Thursday, May 30th 2013, family, friends, and comrades gathered to honor a son, brother, husband, father, friend, and warrior, SSG Michael Simpson. 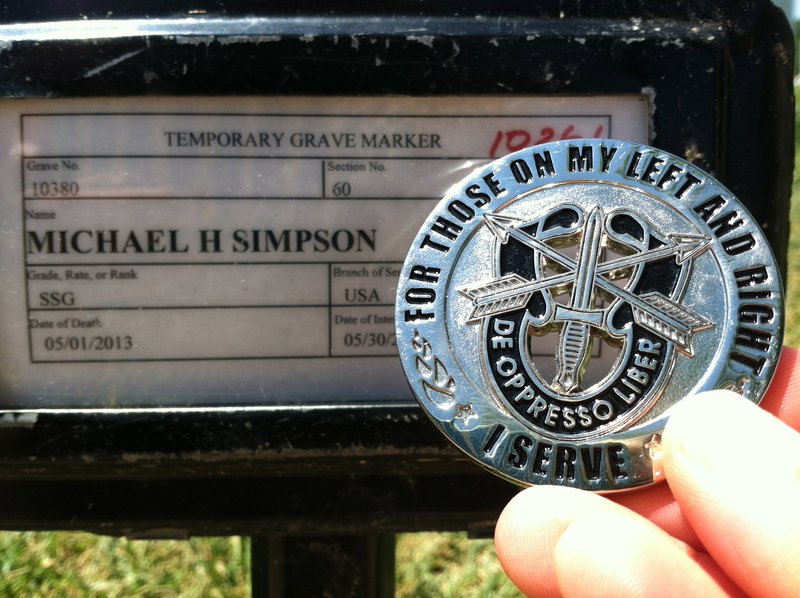 I was honored to be on those hallowed grounds once more, as a witness to the life and service of another great Special Forces brother. Words of appreciation and sympathy can never express the eternal gratitude we have to the Simpson and Eggers families, as well as to all the families who’ve sacrificed and suffered over the past 12 years. Some call Section 60, the saddest acre in all of America. It may very well be so. When I went back for some quiet reflection the day after we buried Mike, I felt the rush of my own emotions washing over me. As I approached the grave of our old comrade, I saw a woman, clearly a young widow, tearfully speaking to her beloved as she knelt at his grave. My heart hurt for her as it has for my own friends who intimately know this pain. 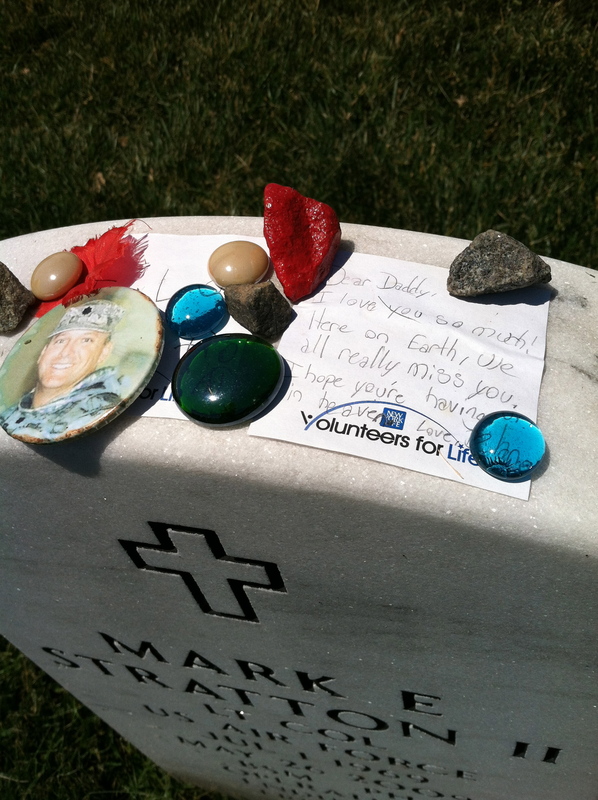 Sitting down in front of Dan’s grave, memories of my brother in arms flooded my thoughts. Time seems to stand still when looking back, yet I know it moves forward. My mind recalls the Eggers boys at such a tender age when their father was killed, but I as look down, I see the pictures of two grown boys. I turned around to see the ground that was once an empty field, now almost completely filled with graves. Originally, I intended to count the number of graves that marked the lives lost in Afghanistan and Iraq from Dan’s place of rest to Mike’s freshly dug grave. However, as I walked the rows, I couldn’t think of numbers…. only of the stories behind each and every name. For hours I was lost in the stories that seemed to be whispered by the trees, every blade of grass, every token of love left by family or friends. I stopped by graves of people that I have been connected with through past units or the military community, ones I didn’t know personally, but love and appreciate nonetheless. About the time I began to wonder how many others I’d crossed paths with unknowingly, a green beret with a 3rd Group flash, resting at the foot of a grave, caught my eye. 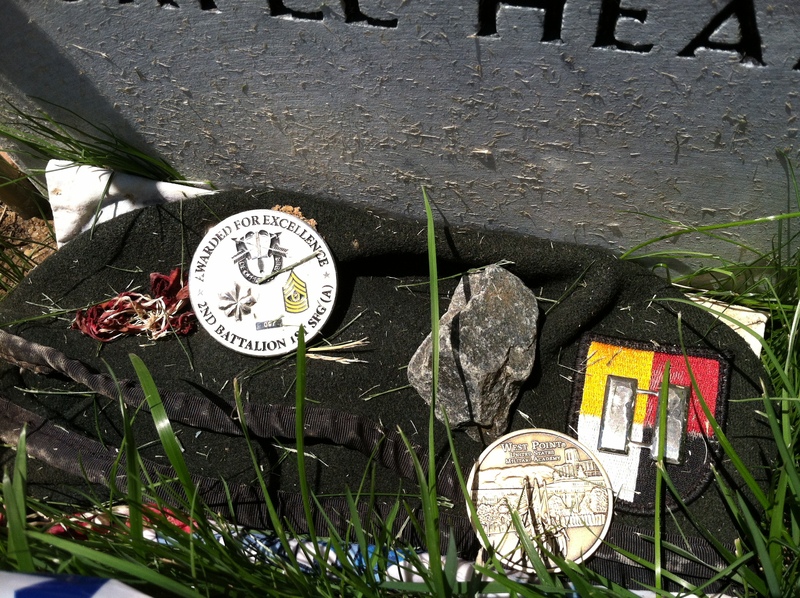 As I looked closer, someone had also left a West Point coin, and I realized this young captain, killed in March of 2013, was a USMA grad, a member of my Long Grey Line family. His death was fresh, of course, and still, sadly beyond him, lie even more graves. The thing about Section 60 is not that the warriors laid to rest there are so different from the warriors of centuries ago. Surely hearts broke just as painfully when a child had to be told of their father’s passing in the days of the Civil War. In my mind, what makes it different, perhaps more difficult to bear, is that the majority of our country has no grasp of how deeply the War on Terrorism has affected so many lives. Over 6,648 U.S. service members have been killed in the War on Terrorism. * Though it is not our deadliest war, it has surely been the longest. When war raged in Vietnam, people protested. War rages in Afghanistan, and it rarely makes headline news these days. Just because the vast majority of Americans ignore this distant war, doesn’t mean it returns the favor. No, war continues to return to us only flag-draped caskets, limbless soldiers, and countless others who bear invisible wounds. Each and every day we continue to put our sons, daughters, spouses, mothers and fathers in harms way, and consequently, we continue to dig up new ground at Arlington. Standing at Dan’s grave and looking out towards Mike’s, I saw the horrific result of our failure to end this war sooner. I’m not blaming any one country, group, person, or political party. I personally believe we ALL owe it to those who’ve died and to those who continue to fight to take collective responsibility. Nine years ago this was a grassy knoll. This is the view now – looking from Dan’s grave towards Mike’s (not even visible from here). On a note of hope, I was blessed to reunite with Dan Egger’s widow, Rebecca, and their two boys on my trip. What a blessing to spend time with Rebecca and her sons on the very same day I stood with Krista Simpson and her two boys for Michael’s funeral. These two widows, separated by 9 years of war, share the sacred bond of sacrifice. I certainly do not know the pain that these remarkable women have suffered, and I hope I never do. However, in knowing them, my faith is strengthened and my sense of purpose is deepened. Over the years, I’ve watched how God has given Rebecca the courage, wisdom, and strength to move forward from the place where Krista now stands. The Eggers boys are certainly living proof of God’s grace in motion. J.J. and Billy are incredible young men who will forever carry their father in their hearts as they aspire to greatness in their own lives. I know that Krista and the Simpson boys will also, not only survive, but thrive in spite of their great loss. 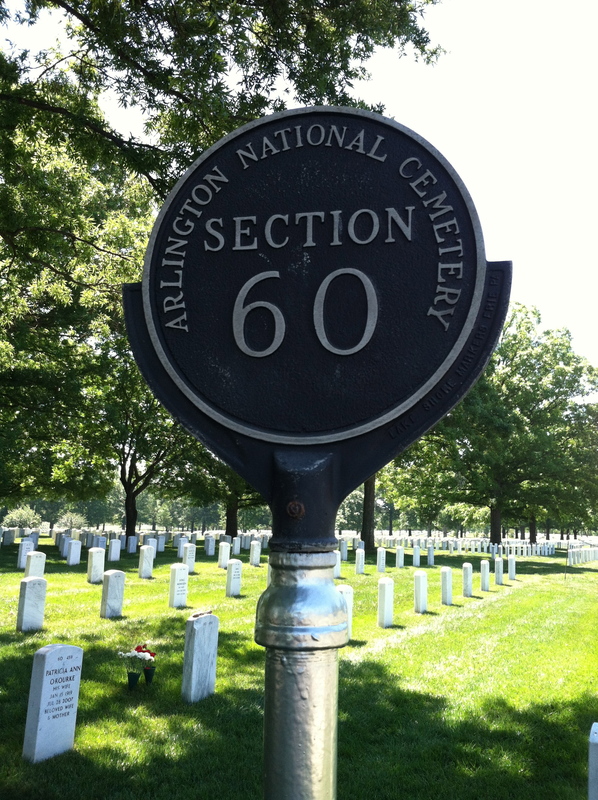 My sincere prayer is that all those who have loved ones in Section 60 will find peace and seek joy even in the midst of their darkest nightmare, remembering that they are connected to every brave soul and family honored on those hallowed hills of Arlington. Likewise, may every American realize that we too are connected, regardless of our personal views or political beliefs, to the thousands of lives lost in the name of Freedom. Let us also remember that there are military service members who stand in harms way each and every moment as we safely scurry about our day and rest comfortably at night. 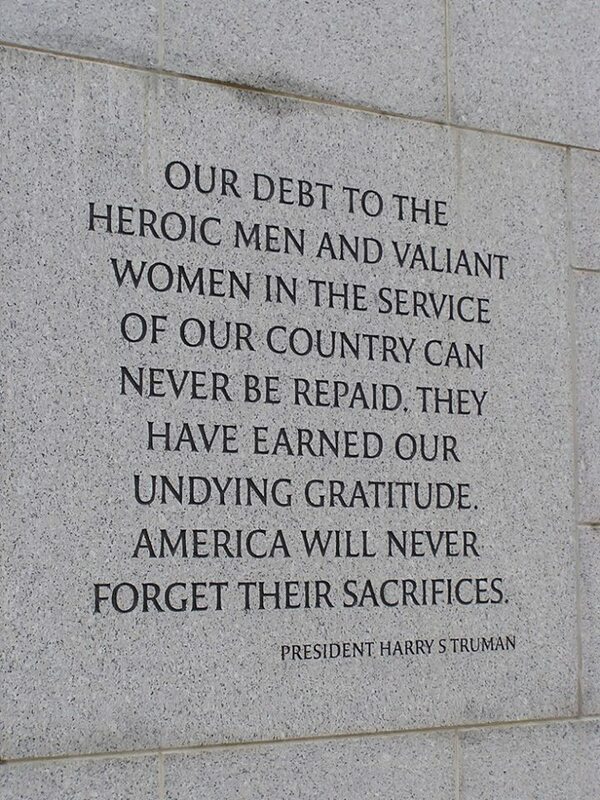 If you do nothing more than offer up prayers of protection for our service members and gratitude to the families of the fallen, you’ve contributed in a positive way. I wrote this piece on my journey back from Arlington. Before I had the opportunity to catch my breath from this profound experience, I received tragic news from Afghanistan again. Next week I will journey back to yet another sacred place where I will lay a sister to rest. Part 2 of this story will be dedicated to LTC Jaimie Leonard and LTC Todd Clark who were killed in Afghanistan on June 8th 2013. *This figure comes from The Washington Post and is clearly not as current as it could be given I know of at least 4 casualties not reported here. Mahalo Pualani. Wonderful writing and expression. Aloha Pualani my friend. It breaks my heart to read your posts. I can only ask why? Why so much war? 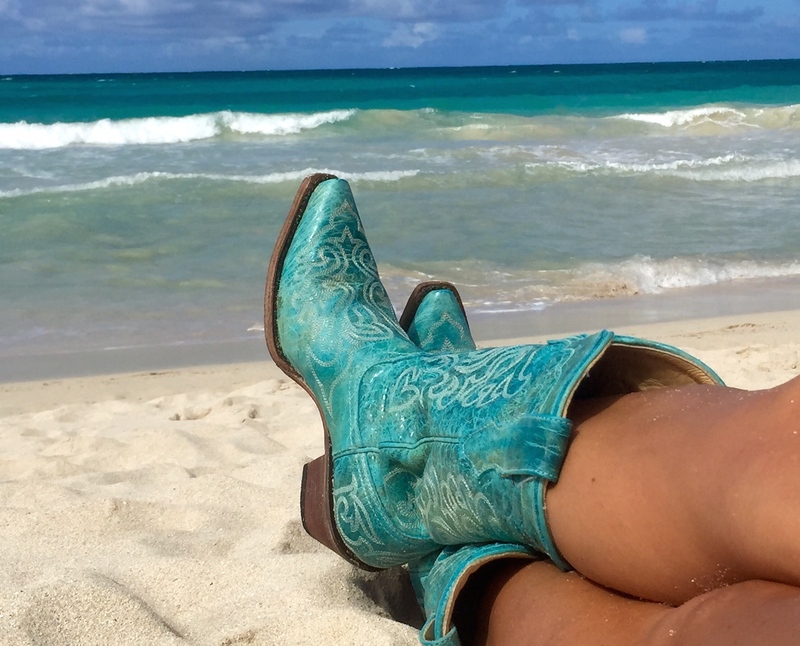 with tears in my eyes I send Jamie all my aloha…..
My heart aches to read this. I join you in your prayer that those suffering, “find peace and seek joy even in the midst of their darkest nightmare,” I’m sure this wasn’t easy to write but I’m grateful that you shared you. And I’m so sorry that there is a part 2 to come.